Magnetic resonance imaging (MRI) was performed in a 52-year-old woman with a several-year history of pharmacologically resistant, migraine-like, left hemicranial pain, lasting 48–72 h, accompanied with left eye “tunnel vision”. The presence of synovial effusion (Figure 1A and 1B) and associated dilated vein without erosions of the joint facets and cartilage (Figure 1C) were revealed on precontrast and postcontrast MRI, consistent with inflammatory arthritis (IA). MRI of the brain and sacroiliac joints revealed no abnormalities. 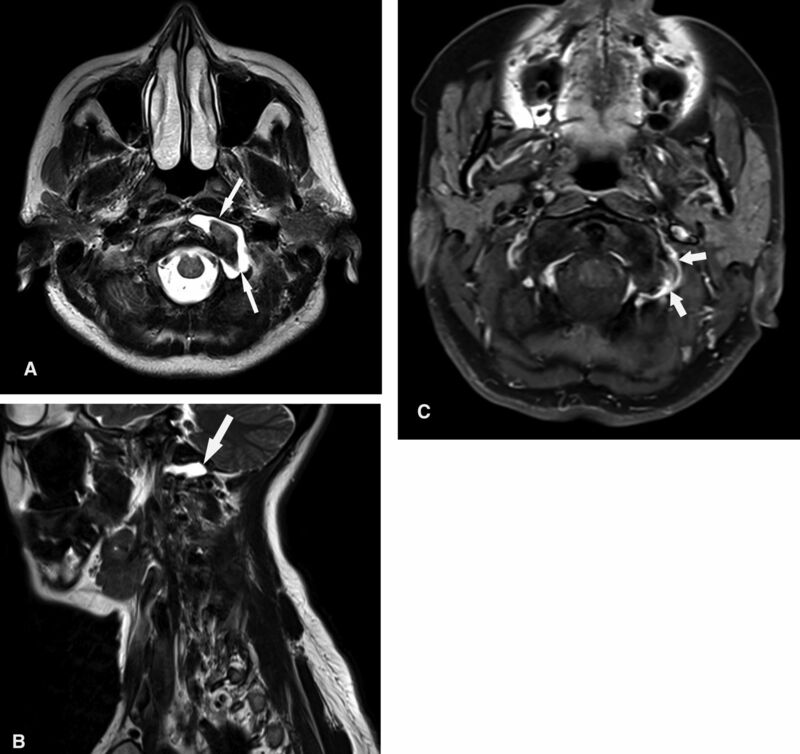 Magnetic resonance images of the left atlantooccipital joint: T2W transverse (A) and sagittal (B) images show the presence of moderate synovial effusion (arrows), while T1 fat-saturation axial sequence (C) after intravenous contrast administration shows the presence of the dilated vein associated with synovitis, without erosions of joint facets (short arrows). No involvement of other joints was present. Rheumatoid factor (RF) was significantly positive, > 80 IU/ml (normal range 0–20 IU/ml), associated with markedly elevated erythrocyte sedimentation rate (ESR) and mildly elevated C-reactive protein levels. After the antirheumatic treatment was administered (etoricoxib 90 mg/day), the ESR decreased from 80 to 20 mm/h, while RF decreased to 40 IU/ml. Marked release of migraine-like symptoms was evident. The involvement of the cervical spine in IA usually affects the atlantoaxial joints. Involvement of the atlantooccipital joint is much less frequent. Computed tomography with multiplanar reconstruction can document cervical spine bone damage and alignment abnormalities. However, MRI became the preferred modality for detection of spinal cord compression and evaluation of neural elements1. It is the only imaging tool that has the ability to assess simultaneously all relevant structures in inflammatory joint disease, including the synovium, cartilage, bone, ligaments, tendons, tendon sheaths, and the presence or absence of synovial fluid2. More recently, dynamic MRI studies have been used with the patient in flexed and extended positions for cervical spine IA evaluation3. Supported by the Ministry of Science and Technological Development, Belgrade, Serbia, Project number 175022. Cervical spine involvement in rheumatoid arthritis: correlation between neurological manifestations and magnetic resonance imaging findings. Rheumatology 2008;47:1814–9.
. Lessons from magnetic resonance imaging studies in rheumatoid arthritis. J Rheumatol 2008;35:372–4.
. Evaluation of flexion/extension of the upper cervical spine in patients with rheumatoid arthritis: an MRI study with a dedicated positioning device compared to conventional radiographs. Acta Radiologica 2005;46:55–66.